Today’s car shoppers have many excellent choices in the midsize 4-door sedan category. The 2016 Honda Accord for sale in Phoenix at your Valley Honda Dealers has consistently been at the top of the charts as one of the best-selling sedans of all time. Celebrating its 40th Anniversary, the Honda Accord has been named a Car And Drive “10Best” award-winner a record 30 times. Not only that, but WardsAuto declares that the Accord has been the best-selling car in America for the past 40 years (Jan. 1976 – Dec. 2015). Just like the hit HBO® series Game of Thrones, there are many other automakers who aspire to knock the Accord off of its lofty perch and rule the automotive landscape; although with no bloodshed or dramatic plot twists. One of these up-and-coming contenders is the 2016 Hyundai Sonata. But does the Sonata have what it takes to vanquish the Accord? Let’s find out by making a side-by-side comparison of these two outstanding midsize sedans. We’ll look at exterior and interior styling, technology features, performance and fuel economy, and lastly safety innovations. We think it will be an interesting contest. And, unlike Game of Thrones, you won’t have to wait until next year for the results. We’ll also consult some automotive experts to get their take on who should come out on top. Both the Accord and the Sonata have upped their game in this subjective department. Each car features modern, contemporary looks that are sleek and aerodynamic. The Accord comes to the party with a bold and sporty new exterior that was completely updated and redesigned in 2015. It’s an Accord like you’ve never seen before with a string of available jewel-like LED headlights, available LED fog lights, a new chrome grille, large new taillights, and a coupe-like roof that flows into a rear-deck spoiler. Available chrome-tipped exhausts and standard 17-inch aluminum alloy sports wheels give the Accord an extra dimension sporty character. The Accord also offers some nice touches, such as rain-sending variable intermittent windshield wipers. The Sonata? To be sure, it’s a fine-looking vehicle. HID projector-beam headlights are available, along with similar LED Daytime Running Lights. Although we don’t see LED headlights offered in this case. Nevertheless, choosing which car looks best really comes down to a matter of personal taste, so we’d rate this as pretty much a tossup. Honda has been crafting outstanding interiors for 40 years, so they know how to give the Accord an exceptionally spacious, comfortable, and refined interior. Both the Accord and the Sonata let their passengers stretch out in comfort. However, the Accord offers 38.5 inches of rear-seat legroom compared to the Sonata’s 35.6 inches. Some of the standard perks you get on an Accord that you don’t get on the Sonata are dual-zone automatic climate control and a rearview camera. You do get a rearview camera as part of the Sonata’s upper trim levels, however. The Accord also gets high marks for ergonomic design. The controls and instrumentation are intuitive, sensible, and easy-to-use. Compare this to the Sonata’s center stack, which features a dizzying assortment of small buttons, making it a little harder to access some critical functions. And the last thing you want to do is take your eyes off the road when driving. Otherwise, both the Accord and the Sonata offer similar upscale appointments on their high-end models (Honda Touring and Sonata Limited), including top-grain leather seats, leather-wrapped steering wheels, and so forth. The 2016 Honda Accord comes out swinging in this category with an array of cutting-edge infotainment technology. Standard features across all models include Bluetooth® Streaming Audio, a convenient USB audio interface and access to Pandora’s extensive music library. EX and above trim levels add SiriusXM® Radio, HD Radio® Apple CarPlay™ and Android Auto™ for unsurpassed connectivity to your smartphone. 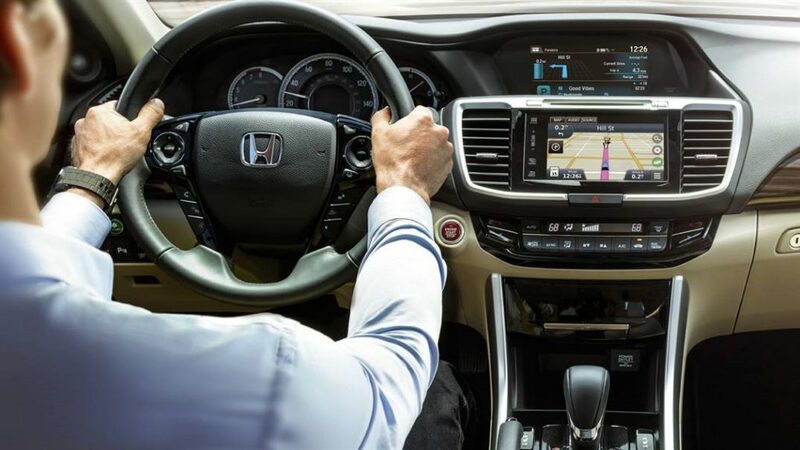 Additionally, the Accord offers a responsive 7-inch display audio touchscreen, along with an additional display that communicates additional information at a glance. You’ll also find speed-sensitive volume control that automatically adjusts the volume of your music to compensate for road noise. Plus, the Accord also offers HondaLink®. It gives you the power to control a variety of Honda functions directly from your smartphone, such as scheduling service appointments, and more. The Sonata offers a similar complement of tech features on its top-end trim levels. Where the Accord clearly pulls ahead of the Sonata is when we compare performance and fuel economy. The Accord’s standard iVTEC® inline 2.4-liter 4-cylinder engine generates 185 horsepower and 181 lb.-ft. of torque. This is comparable to the Sonata’s 2.4-liter, 4-cylinder engine that also puts out 185 horsepower, but just 178 lb.-ft. of torque. The Accord’s additional torque can make quite a difference when you mash the gas pedal to merge onto the freeway or pass a slow-moving 18-wheeler. The Sonata’s 2.4-liter engine does edge out the Accord’s, but just barely. The Accord gets an EPA-estimated 24 mpg city/34 mpg highway compared to the Sonata’s 25 mpg city/38 mpg highway. But it’s a different story when you step up in weight class. The Honda’s excellent Earth Dreams™ iVTEC 3.5-liter V6 churns out an authoritative 278 horsepower and 252 lb.-ft. of torque. The Hyundai doesn’t offer a V6. Instead, they use a smaller, 2.0-liter, turbocharged 4-cylinder engine that makes 254 horsepower and 260 lb.-ft. of torque. While the Hyundai does edge out the Honda regarding torque, it huffs and puffs at a higher rev range compared to the V6’s smoother power output. And, yes, the Hyundai’s 2.0-liter turbo does get slightly better city gas mileage at up to an EPA-estimated 23 mpg compared to the Accord’s 21 mpg numbers. However, Accord’s larger and more powerful V6 gets up to an EPA-estimated 34 mpg highway compared to the Sonata’s EPA-estimated 32 mpg highway. Finally, we take a look at the different passive and active safety features found in both models. Starting with the Accord, you’ll find that it features a full complement of advanced safety technologies which combine to score top IIHS and NHSTA safety ratings. The Accord’s ACE™ body structure is engineered to absorb the impact of a collision evenly throughout the frame. The Accord also offer multiple dual-stage airbags, as well as advanced SmartVent® front side airbags with rollover sensor on certain models. The Accord’s innovative, available Honda Sensing™ suite of active driver safety technologies include Road Departure Mitigation, Forward-Collision Warning, Collision Management Braking, Lane-Departure Warning, Adaptive Cruise Control, and available rear parking sensors. A multi-angle rearview camera is standard. The Sonata features a comparable assortment of safety features and also achieves high safety marks; although it scores just a 4-star rollover rating compared to the Accord’s 5-stars. As we’ve seen, both the 2016 Honda Accord and the 2016 Hyundai Sonata are two outstanding four-door midsize sedans worthy of your consideration. But in the final analysis, the Accord scores with more horsepower, more standard features, a friendly ergonomic interior, and fresher exterior. But where the Accord really aces the Sonata is its unsurpassed reliability, dependability, and legendary quality. To be sure, the Sonata has come a long way in these areas but still has miles to go to catch up with the Accord’s superlative quality. After building Accords for 40 successful years, you learn what works and what doesn’t. And in the case of the multiple award-winning 2016 Honda Accord, it all works out to a better car for the money than the 2016 Hyundai Sonata. How good is the new 2016 Honda Accord for sale near Phoenix? Find out by taking one for a test drive at one of our conveniently located Valley Honda Dealers near you. You’ll save more on a new 2016 Hondas for sale in Phoenix this summer with sizzling special Honda offers that will put a new Honda in your driveway for less than you’d expect.